Here’s why Ela Family Farms peaches are the best. WHY ARE ELA FAMILY FARMS PEACHES THE BEST? We have the tastiest, sweetest corn from Munson family farms in Boulder. Saturday, Aug. 25, 2:30–5:30 p.m.
What exactly is the Chef Throwdown? Some of Denver's finest chefs gather together, each one cooks a flippin' fantastic dish using a Niman Ranch protein (beef, pork, lamb — sorry, no vegetarian offerings), serves it to you, and then you eat it. And then you eat some more: You get to enjoy ALL of the dishes, and ALL of the money goes to the Niman Ranch Next Generation Scholarship Fund (read about it here and here). You can buy "tickets" on our website by going right here (really, what are tickets anymore? — we'll check you in when you get there). And while we can't guarantee an actual throwdown involving Lucha Libre masks, we're not ruling it out. And just who are these chefs? Glad you asked. They'll be donating their time to cook for you, Niman Ranch is donating the meat, so all of this money goes to the Scholarship Fund. Plus it's just a really fun afternoon. These are big shrimp, 10 to 12 to a pound, meaning they're 1-1/3 to 1-2/3 ounces each. Perfect for using as flotation devices in a swimming pool, installing onto a skewer and grilling, and snuggling with in a stuffed animal's stead, although that may attract a great many neighborhood cats. Prices good through Sunday, August 26. 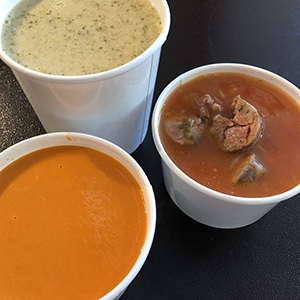 Why do we put our soups of the day on our homepage? Because they're so good you need to know about them posthaste. 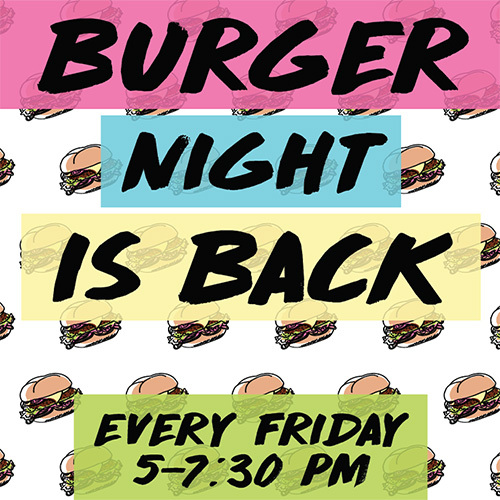 Join us for the gloriousness that is Burger Night — Fridays, 5:00 to 7:30, at both stores, all summer long (technically all late-spring & all summer & all early-fall long).